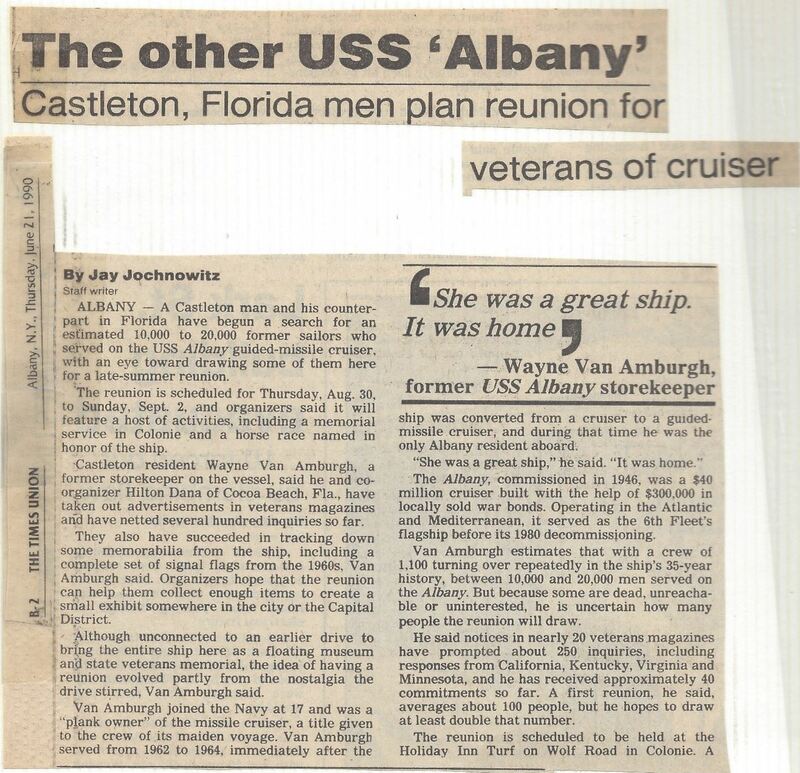 Times-Union city editor aboard the USS Albany on a training cruise in the Atlantic, watches activities from a vantage point on the main deck. 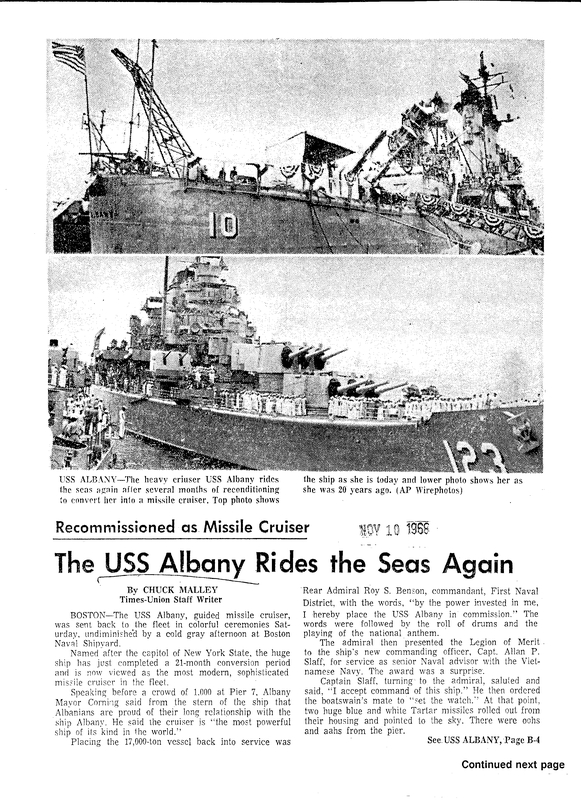 The heavy cruiser USS Albany, financed by Albany citizens who bought $40,000,000 worth of war bonds, is in a training cruise to Bermuda May 18-25. 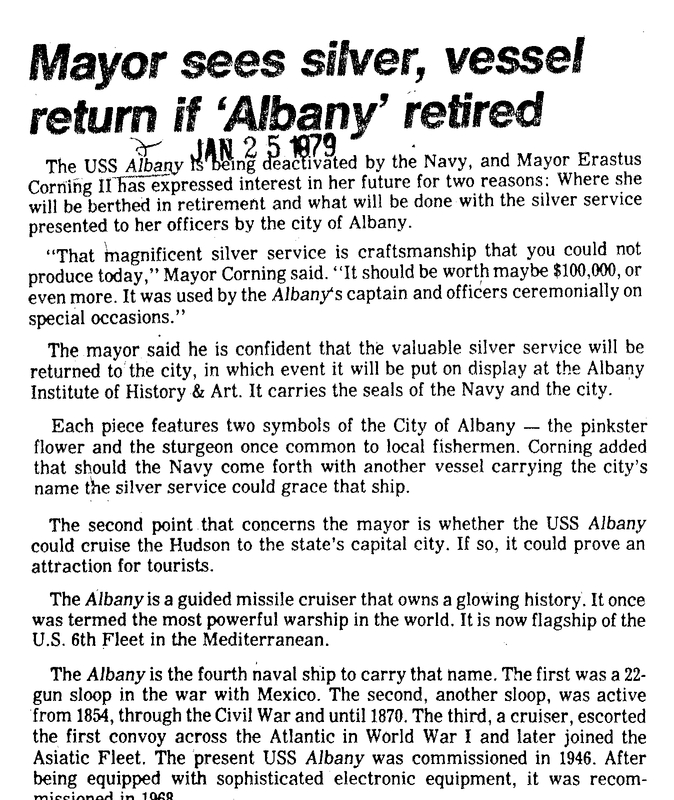 In a patriotic observance of Naval Reserve Week, May 11-25, The Times-Union assigned Con Heffernan, city editor, to cover the cruise. 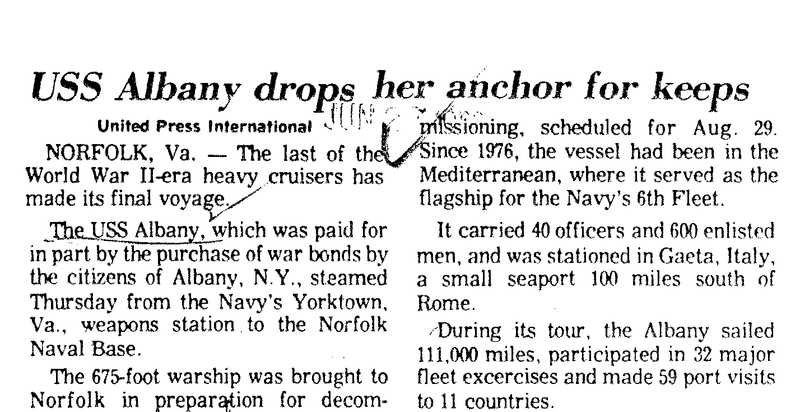 His third dispatch, radioed from the cruiser, follows. 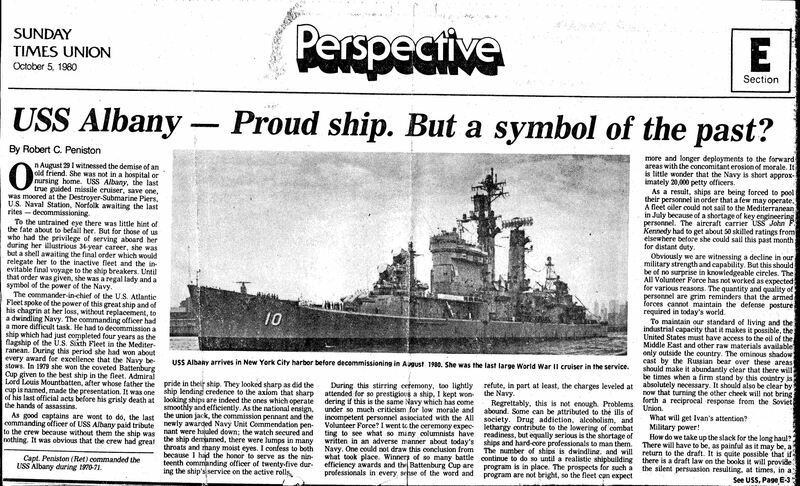 By CON HEFFERNAN \ Times-Union City Editor ABOARD THE USS ALBANY, May 21—I had heard much about radar and how it enables ships to see miles ahead through night or fog. Today I thrilled to the unforgettable experience of plotting the course of another ship miles in front of us and then seeing the freighter appear in the flesh on the horizon exactly where the radarscope told me it would. 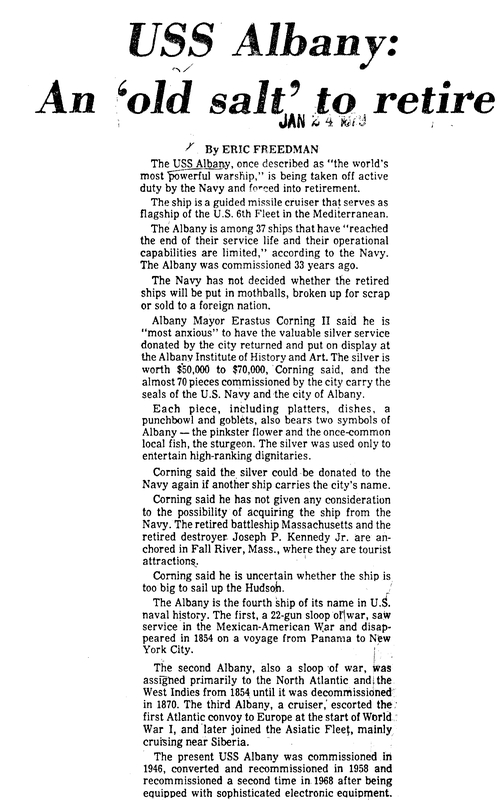 Captain John M. Ocker of Empire, Mica., the boss of the spanking new heavy cruiser named after the city of Albany, invite d me to bridge as he cleaved the man-o-war through the Gulf stream towards Bermuda. 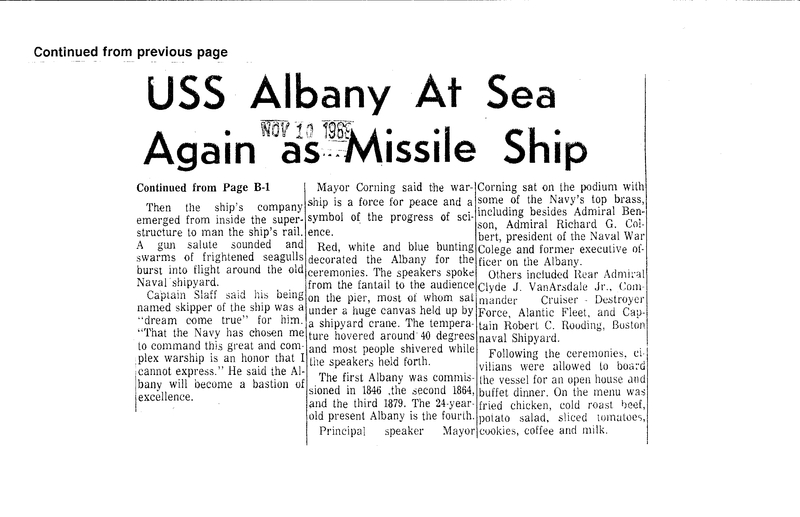 Then, he had his executive officer, Comdr. 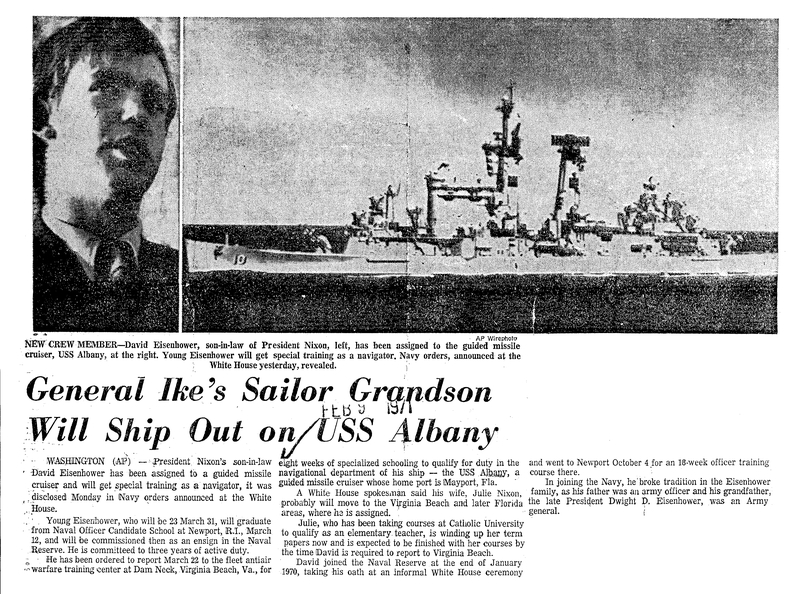 Howard R. Prince, of Chicamauga, Ga., introduced me to the cruiser’s up-to-the-minute radar. The captain’s bridge is six flights up into the superstructure. There, the skipper, who has commanded submarines during his 24 years in the Navy, is in constant touch with every vital part of the vessel. His office is a semi-circular affair with a windshield commanding view. 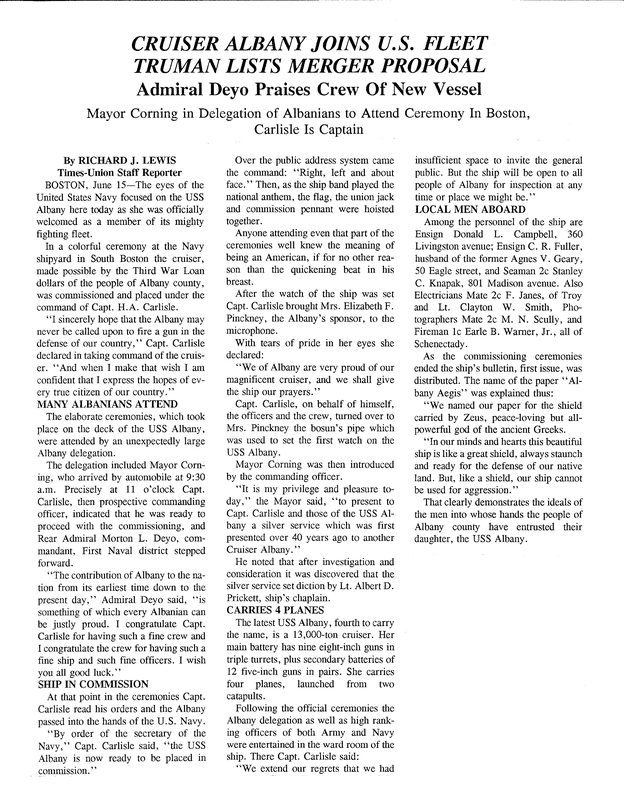 His chief aide to Navigator Edwin K. Jones, a commander, and both Jones and the captain work, through several other aides who sure in direct contact with subordinates who toad the muscle and senses of the craft. I have the impression Captain Ocker, beneath his austere Annapolis mask, to like a kid with a new toy. 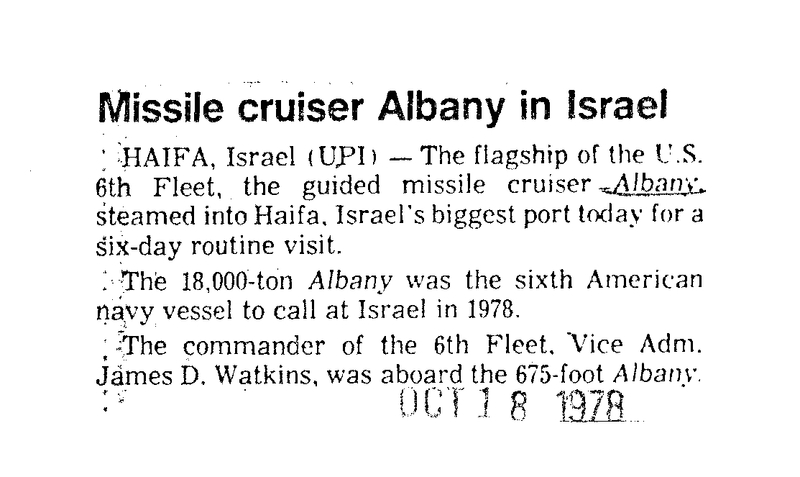 This is really his first time at with the “Albany” if you don’t count his taking her from Norfolk to New York Ma the week after his appointment to succeed Captain Harold Carlisle. 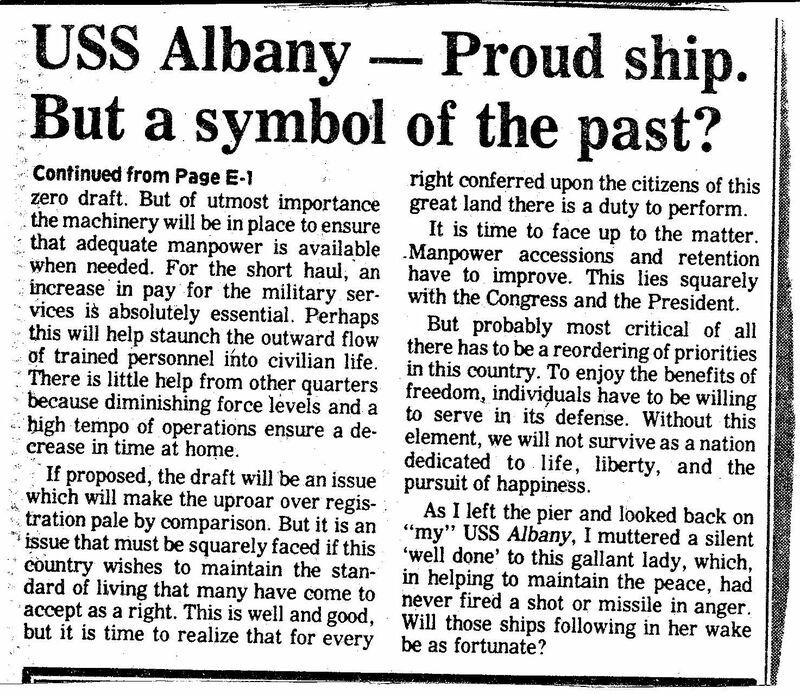 He works intensely up there, even having his meal aloft every time he asks information through his ship’s phone aides, he Is learning or confiding some fact about the performance of the $40,000,000 fighting ship. I’m still at sea as far as knowing how the skipper does it, but of this I’m certain. ln his bridge office with his giant dashboard, Captain Ocker is constantly feeling the pulse of the ship purchased through the war savings of Albanians. Radar’s principle was explained simply to me by Commander Prince. He said it’s like shining a flashlight at some object. Some of the rays are reflected back. These reflections are radio waves cause the blur on the radarscope that tell of the presence of another vessel or plane. Then, he let me fiddle with the dials. I saw a blur on the yellow screen a few degrees off our course to the left It was some 15,000 yards distant in the fog, a meter said. As I took saw sights via radar, the distance dwindled until the meter insisted the of the blur was only 1,10 0 yards away. I then peered out over the gun batteries, and through the haze there soon appeared a freighter. Many of the 300 Naval reservists aboard for this training cruise are getting detailed instruction on the latest applications of radar, I’m told. Other reservists are learning the very latest about their specialties. Lectures, movies and practical work are combined in this training to give Uncle Sam a well-trained reserve force. 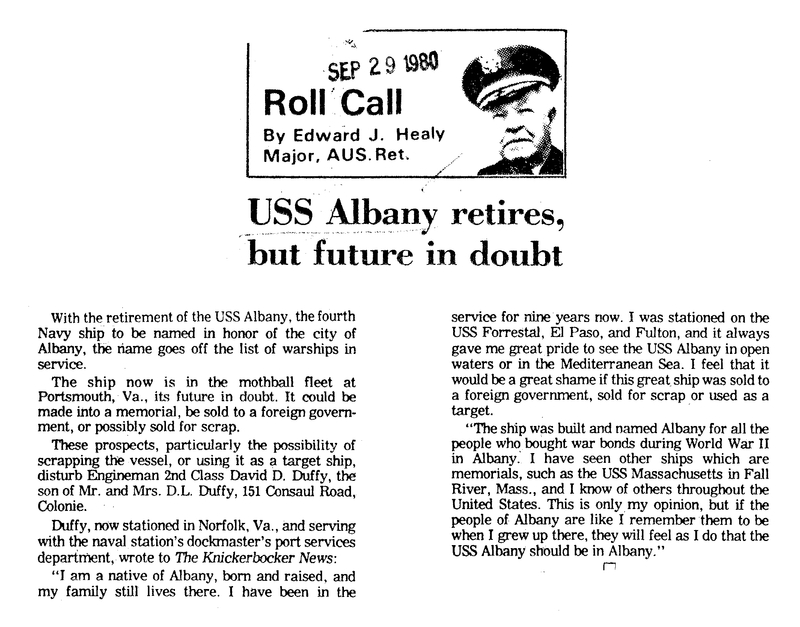 Cruise notes: Raymond C. Venn, Storekeeper, 2nd class of 613 Hamilton Street, a reservist who was getting the payroll ready for Friday, asked me to send his regards to the lads at Jack Hayer ceremony. 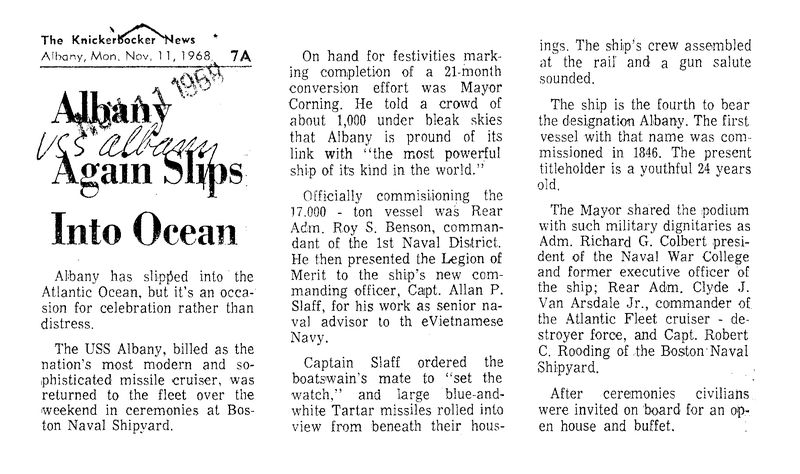 Today was the burial at sea of the remains of an ex-Navy man from Yonkers who was killed. 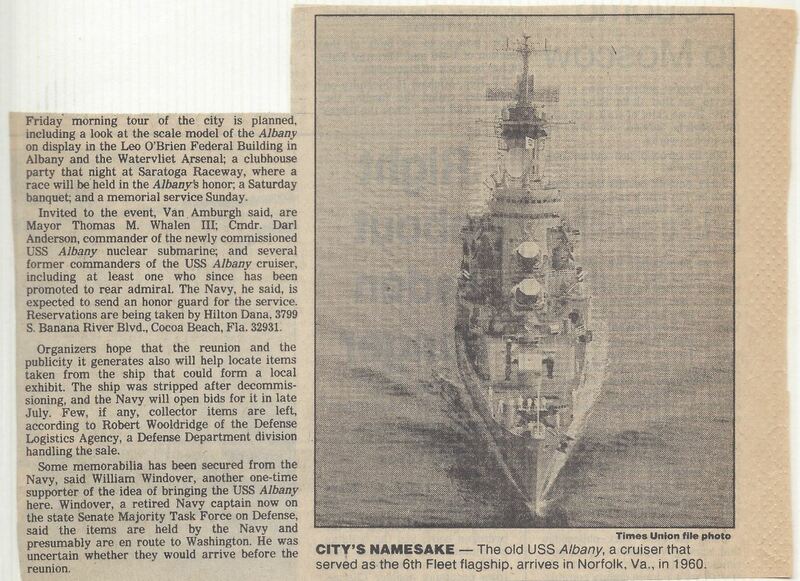 Navy was to scatter his ashes over the Atlantic. Last night we met on the open deck and saw a movie showing Pat O’Brien in “Perilous Holiday.” One of the drills today was called “Man Overboard”, The ship circled and stopped and Oscar Dummy was tossed over and retrieved. The sea continues calm as a pond and the breeze off the Gulf Stream are strong.